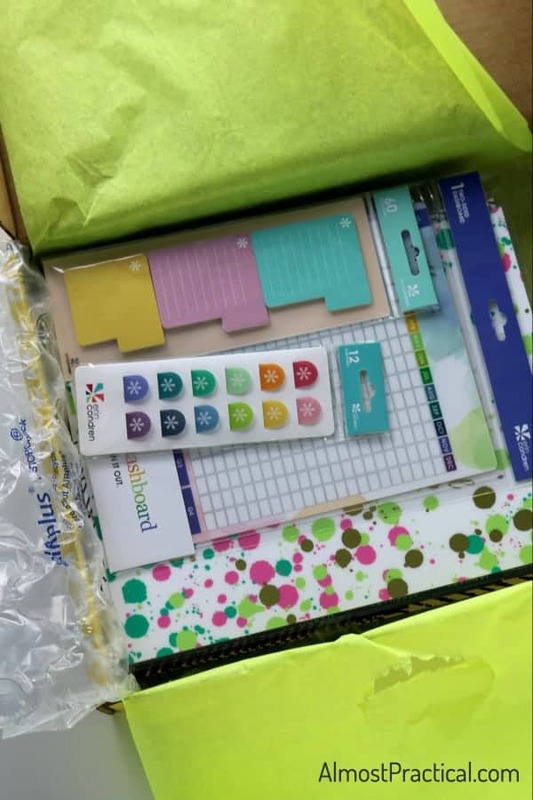 Disclosure: I received a complimentary review copy of the Erin Condren Deluxe Monthly Planner and accessories for this review. All opinions are my own. It is an exciting day for me today because I get to talk all about my favorite topic – paper planners. 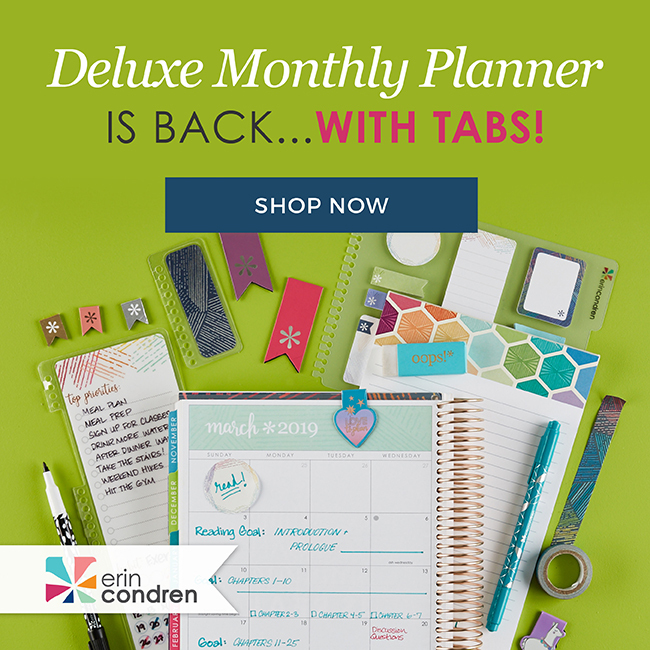 And – we're not talking just any paper planner – we are talking about the Erin Condren Deluxe Monthly Planner. 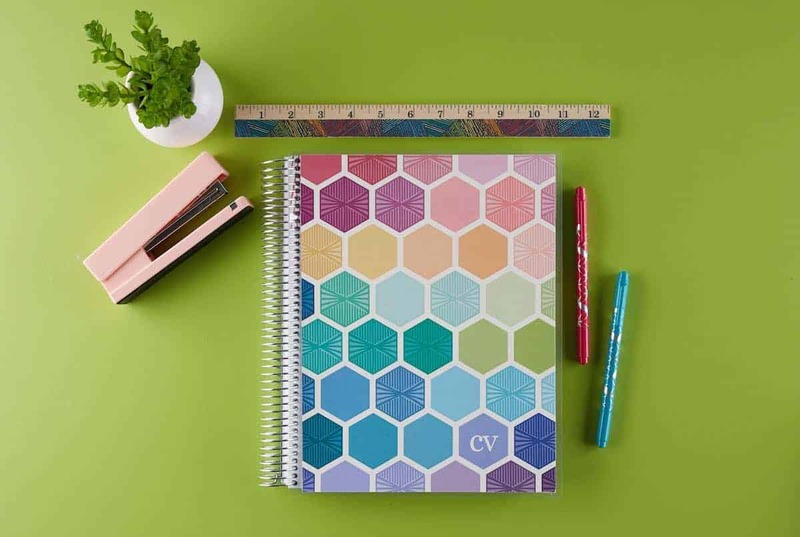 You probably know that I am a huge Erin Condren fan – you can read my Erin Condren Life Planner review here. So, when I heard about the Deluxe Monthly Planner, I had to give it a go. 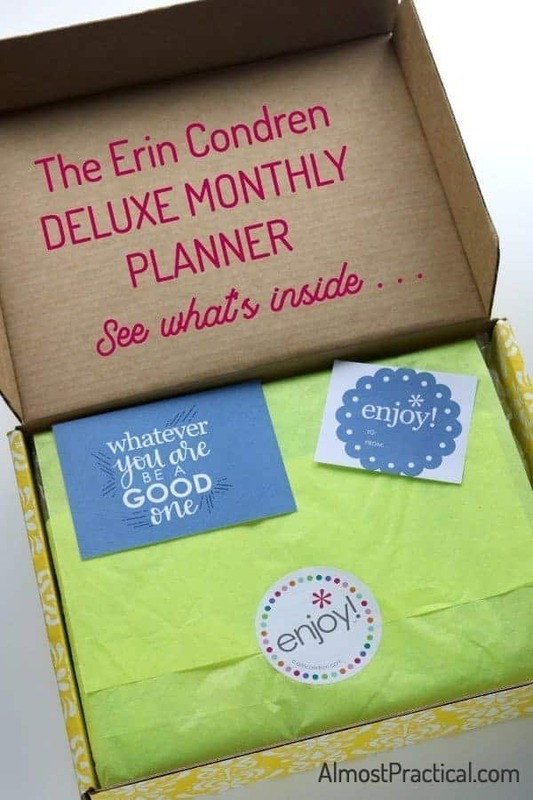 What Is The Erin Condren Deluxe Monthly Planner? 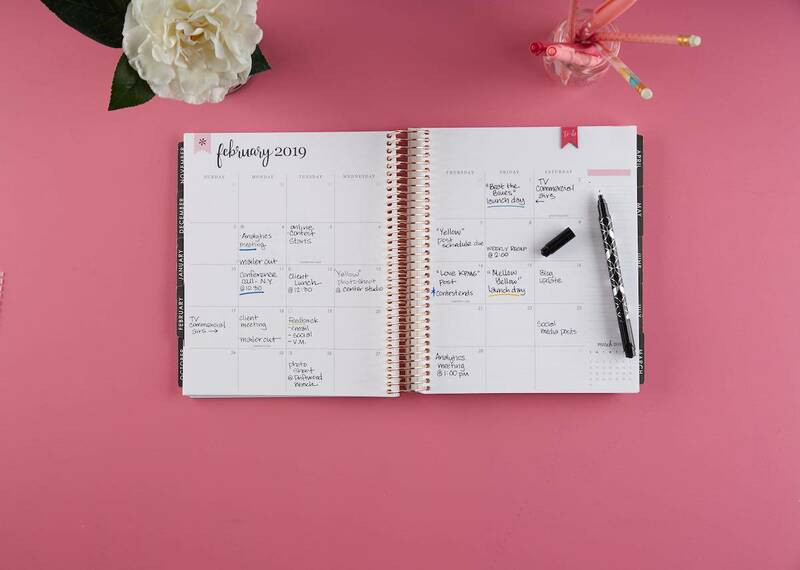 The Erin Condren Deluxe Monthly Planner is a combination of a beautiful monthly calendar and a notebook all rolled into one. You can see the official list of everything that is included here – just scroll down to the “What's Inside” section. But I will give you a few of the highlights that I love, below. The beauty of the Deluxe Monthly Planner is that you can customize many of the included features to suit your needs. In keeping with Erin Condren tradition, you get to choose from a huge variety of cover designs that you can customize with your name. I have to say that choosing a cover is probably the hardest part – because there are so many gorgeous ones to choose from! The good news is that if you can't decide, you can always order a spare and swap them out on occasion. But I was really tempted by this one, this one, and this one, too. The covers are laminated in sturdy plastic that you can write on with wet erase markers. Before we dig deeper, I want to talk about the paper. The Erin Condren Deluxe Monthly Planner is printed on a thick, luxurious paper that is a joy to write on – especially with gel pens. I always add pops of color to my planners (it helps me to remember things!). So, it is important to me that the paper is thick. Once you choose your cover, the next step is to choose your color theme. Your choices are Neutral or Colorful. This decision is also harder than it seems. The Colorful theme is bright and fun. Each monthly divider tab is a different color and the monthly spread pages have a colorful header. Alternatively, the neutral theme is more black and white with small pops of muted colors spread throughout. The best way to see the differences in the two color themes is to start an order for the Deluxe Monthly Planner on the Erin Condren site. When you get to the step where you choose your color theme, click on each theme and scroll through the preview pages that appear to the left. I ended up choosing the Neutral color theme – even though and because I am more of a colorful person. Usually, I embellish my planner pages with colorful writing, stickers, and sticky notes. Since I want my notes to stand out, it made sense for me to choose a neutral backdrop for my planning. I was happy to learn that the Erin Condren Deluxe Monthly Planner comes in a choice of 2 sizes. You can choose a 7″x9″ or 8.5″x11″ size (for a small upcharge). While I prefer the smaller size for the Erin Condren Life Planner, I went with the larger 8.5″x11″ size for my Deluxe Monthly Planner. I will be using my Deluxe Monthly Planner to help me either organize my finances or manage the content for my blog – I haven't decided yet. (sheepish grin). Either way, I will most likely use the planner at my desk. Since I won't be toting it around, I appreciate having the extra inches for writing and planning. The Erin Condren Deluxe Monthly Planner is a 12 month planner. BUT – you can choose your starting month. This is huge because you don't have to wait until January or July or something like that. For example, I ordered my planner near the end of July but I knew we would be away on vacation for the beginning of August. I wanted to allow time for the order to get to me plus I knew that I would not be available to start using it until September – so I ordered mine to start in September. It includes the 12 months that will end at the end of next August. The Deluxe Monthly Planner comes with 40 perforated note pages at the end of the planner. You can upgrade this to 80 pages or 120 pages. It is worth noting that there are 5 unperforated note pages included within each monthly tab as well. 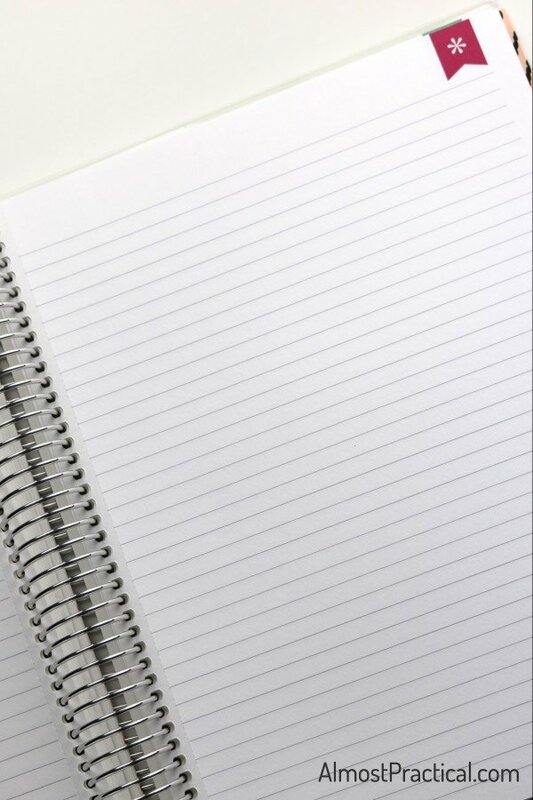 So you have plenty of space for taking notes! I went with platinum because I really like the silver color. Finally, depending on the cover style you chose, you can personalize your cover with your name or initials (or not at all, if you don't want to personalize). Related: Which Planner Layout Will Make You More Productive? 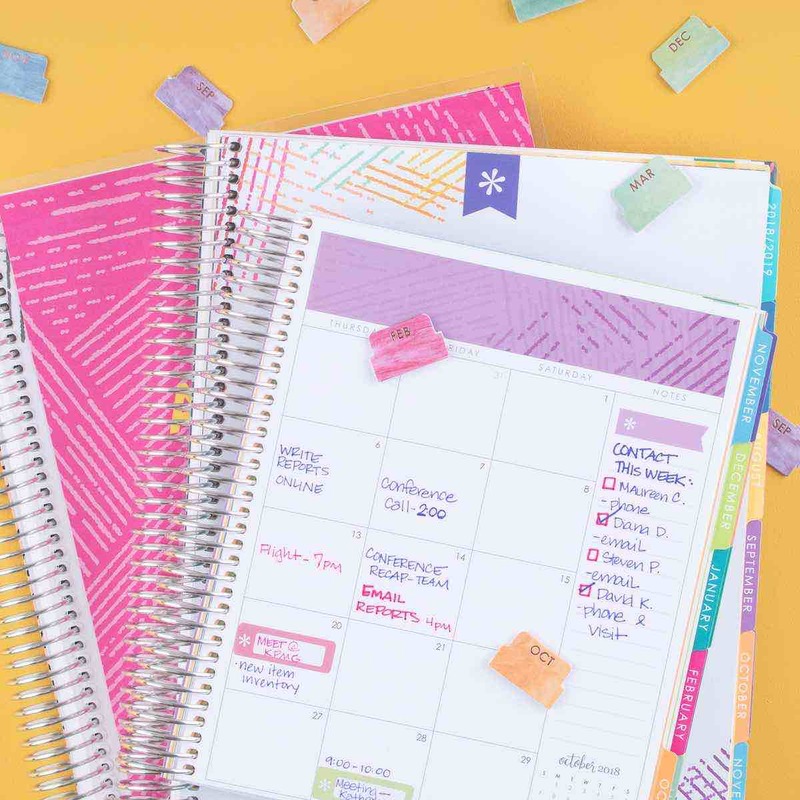 While there are tons of customizable choices in the Erin Condren Deluxe Monthly Planner, there are a lot of fun features that are standard as well. and a bound in folder. 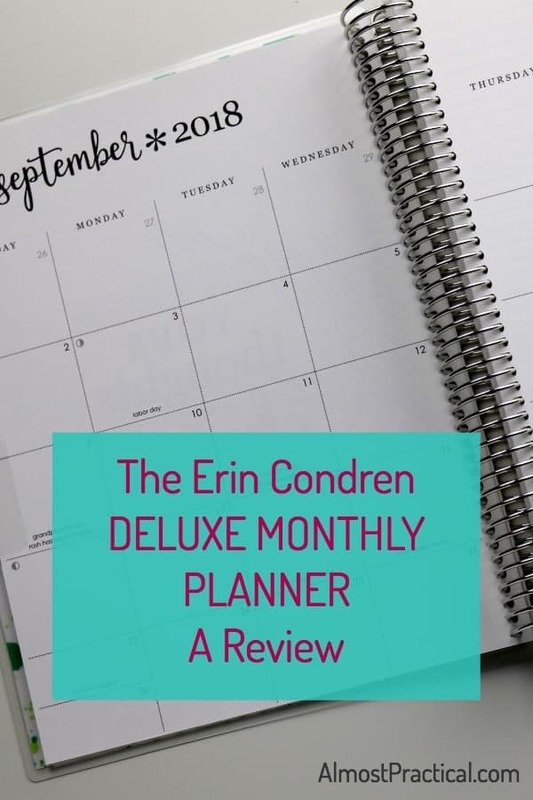 You might be wondering how you would use the Erin Condren Deluxe Monthly Planner. As I mentioned, you could use it to track your finances or manage your content for your blog. or any little corner of your life. I have found that one, single planner is never enough to manage life effectively. Even though I am a LifePlanner user – which is perfect for managing my own daily schedule, I need a separate planner for each bucket of things in my life. Take my blog, for example. Typically, I schedule out content, email newsletters, and social sharing far into the future. I also brainstorm ideas, take tons of notes, track my stats, and change things around (a lot!). If I did all of this work in my own personal daily planner it would be a big disorganized mess. So, for this, the Erin Condren Deluxe Monthly Planner is a perfect solution. The beautiful covers and format make it very official and a joy to use. The planner gives me a central location to do all my planning – and I know exactly where to look when I need something. 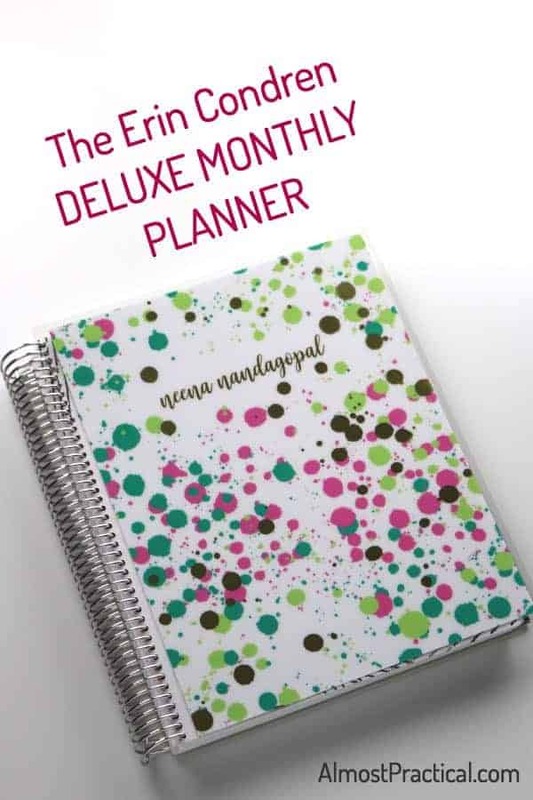 If you love Erin Condren products as much as I do – I encourage you to hop on over to their site and take a look at the Deluxe Monthly Planner. It is a great productivity tool!